I just graduated from college when development started on Owlboy. At least, that's when public development began. That was in 2008. D-Pad Studio, a five-person team, has worked on the game ever since. This was an indie game before the indie game movement really caught on. They took a break, mind you, to develop a game called Savant. That was a fun title, and I imagine it worked to reinvigorate the creative process for Owlboy. While certainly not always the case, long development times on games tend to mean that progress moved poorly. That is, the length of time a game is developed can get too long. The game becomes over-complicated, problems stack and signs of development fatigue show themselves in big ways. 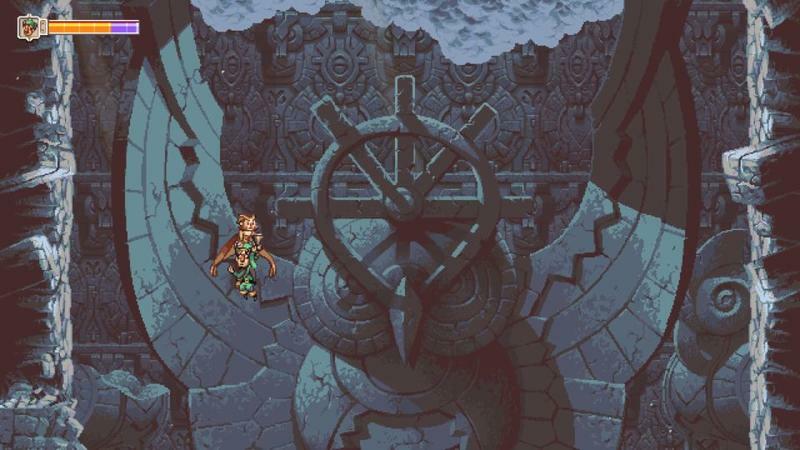 With Owlboy, surprisingly, D-Pad made incredible use of that time. 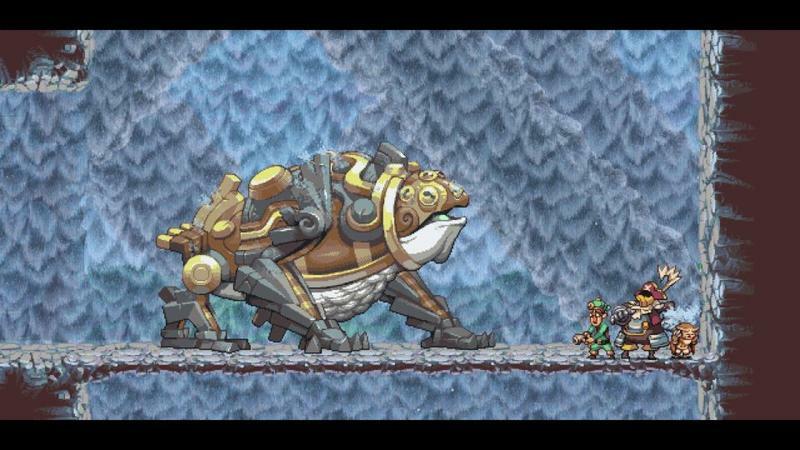 At one point, Owlboy was a work in progress for the Xbox 360. Obviously, that's gone by the wayside. This is a PC exclusive currently, though D-Pad told me directly that console ports are their intention. I hope so. Owlboy is wonderful. Owlboy is focused and tight. 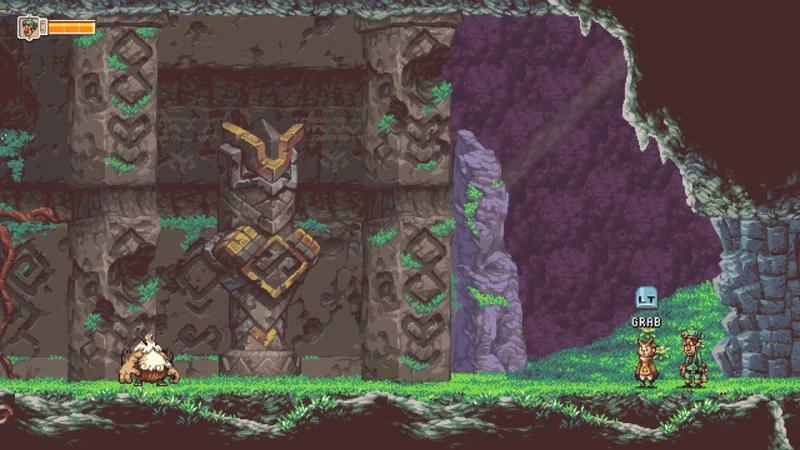 In Owlboy you play an owl named Otus. Your main abilities are flight and carrying. You can carry objects in game, and that ranges from food you can eat to fill or buff health to clouds you can squeeze to fill water switches. You can also carry people. You can't just fly up to random characters and take them for a tour of the clouds. No, you'll meet special characters that, through one means or another, wind up on your "team." 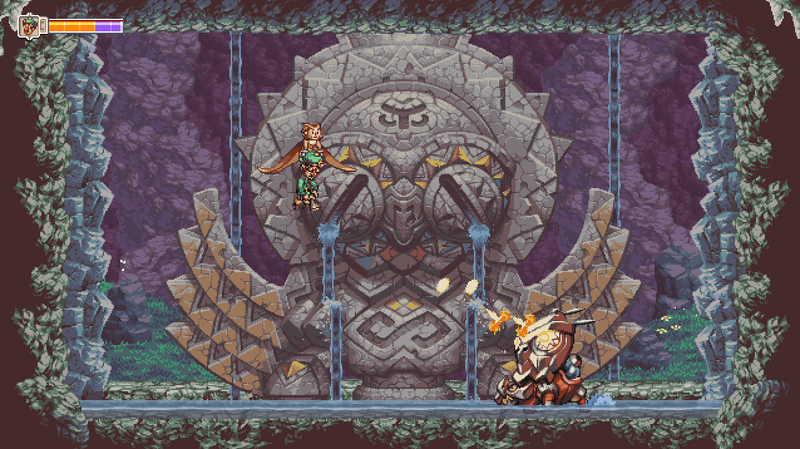 Each of these characters has a weapon that you'll control as Owlboy. Suddenly our flying platformer turns into a shooter, and it works really well. That flight is used to navigate spaces in a sort of Metroidvania-esque affair. Now, it's not as, let's say, overwhelming as a Metroidvania game can be. The campaign is more focused than a complete free roamer with roadblocks built-in, so you'll usually know exactly where to go. Admittedly, that path to victory can get obscure at times, but it's never so bad that the game suffers because of it. Then there are the paths blocked by puzzles. Those puzzles are usually clever though never overly challenging. They sort of work in the same way a 2D Zelda title might, offering enough challenge for that sense of reward once completed. Enemies themselves are puzzles, too. Sometimes combat is as simple as blasting away when locked onto an enemy. Other times, you'll need to pick your attacking directions, spin to remove shields or avoid entirely. Owlboy isn't simply a game where you can spam fire your way through minor situations and boss battles. Each area brings unique challenges. There are a few stealth sections, too. I personally found them manageable, though D-Pad offered up that they were patching the game a bit just before release to tone the unforgiving nature of one section down a bit. I tell you that not to highlight the section, rather to indicate that D-Pad is actively invested in bringing Owlboy's gameplay as close to perfection as possible. They're just about there, too. This bird tells a good story with cool characters and charming moments. I won't spoil things for you guys. 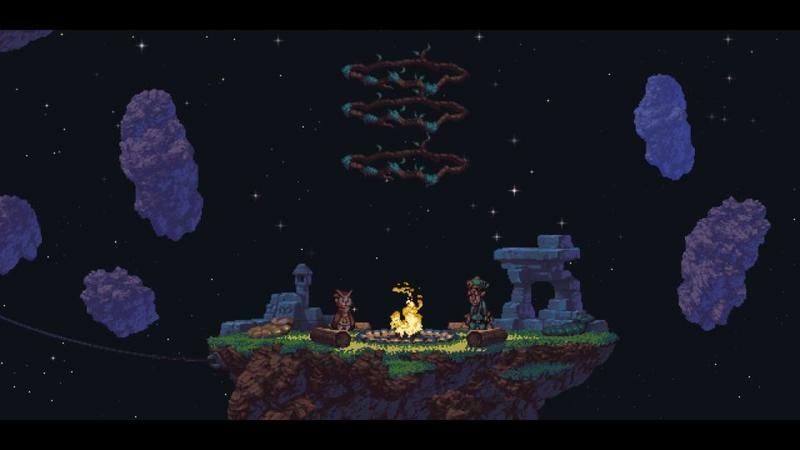 Know that Owlboy opens up on a weird, dark and somber note. You'll know within the first five minutes that there's more to this story than a simple adventure quest. D-Pad manages to immediately establish Otus as a character, and you'll likely love him and feel for him starting then. From there, every personality you meet is fun and varied. 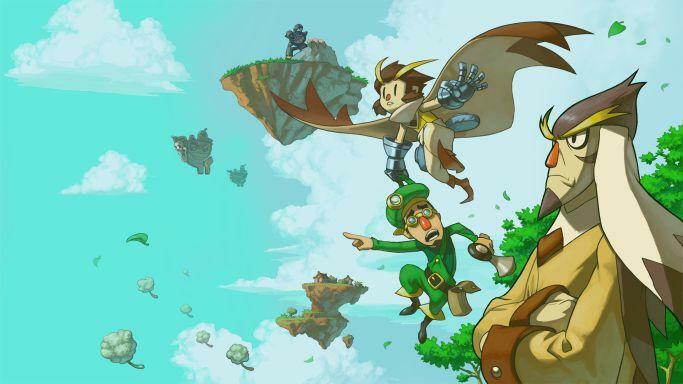 Whether it's the polite and noble pilot, your angry teacher, your best friend or the cowardly member of a demolition squad, Owlboy is densely packed with characters featuring sharp personalities. Those characters go on to create charming situations, too. You'll laugh along with the heroes at times, and you'll pause and stare at a newly discovered area as your team members do, too. The whole crew is funny, at times, and Otus' adventure is as somber as it is thrilling. 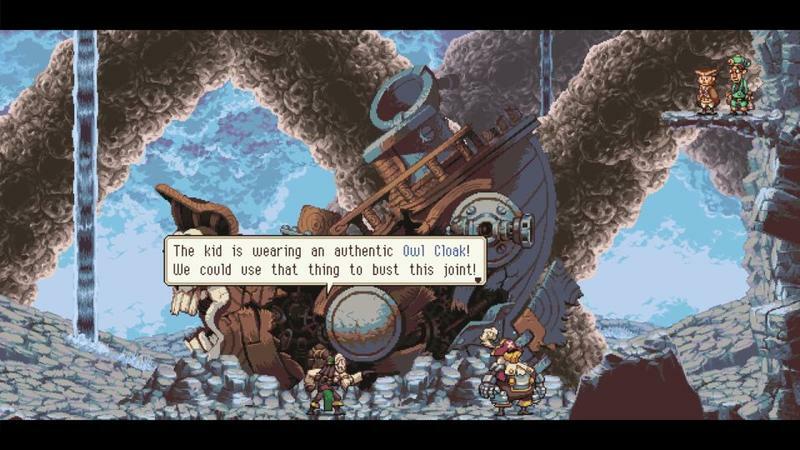 The result is this blend of fun, funny and emotional that works really well to elevate Owlboy's story and characters. After 10 hours with the game, I was sort of in love with the whole cast. I've gotten this far and I'm only now mentioning the graphics and audio design, but Owlboy is fantastic in both regards. This game uses that pixel-art, semi-retro style that's been all the rage for the last few years. 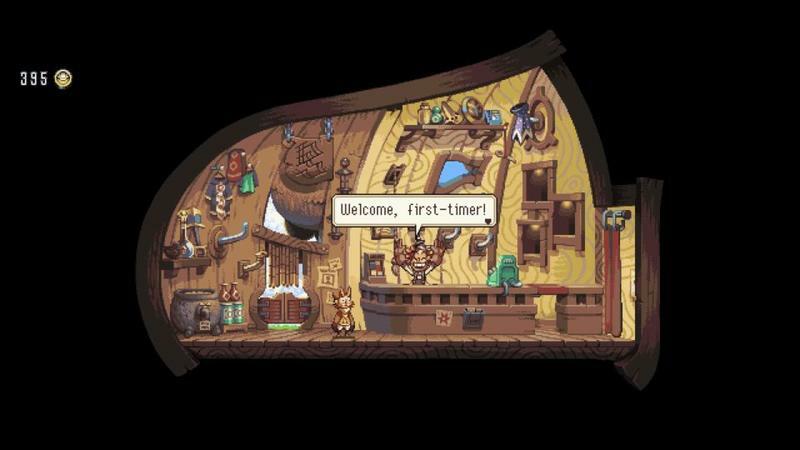 Remember, we weren't sick of this look at all when Owlboy began development. The crazy part is that this game was among the first to revisit the classic look, and it releases much later as one of the best looking I've seen. Every single area feels hand crafted and lovingly slaved over, and the product reeks of obsession when it comes to detail. Environments are lousy with complexity in art design, and that vivid style makes this a world you'll want to really sink yourself into. Then there's the soundtrack. You can actually dig into a sample of that below. It's really something special, and it plays as you continue to fly and push your way through the world. Moments are made more enthralling through the tunes used here, and composer Jonathan Geer deserves a ton of praise for his work. 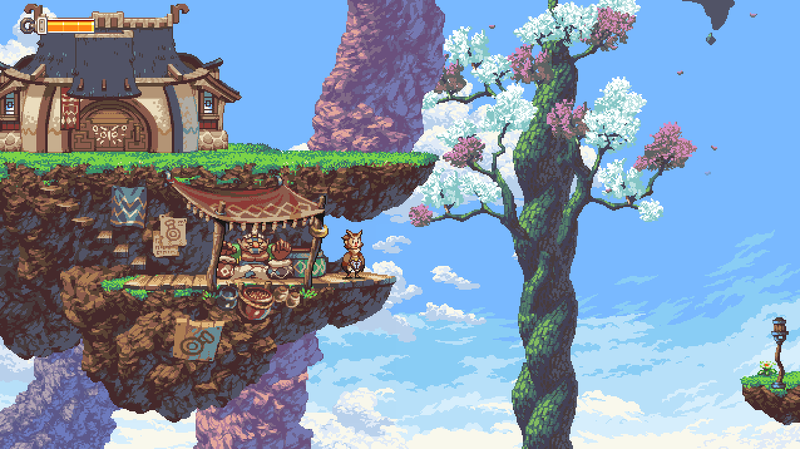 Owlboy is without a doubt one of the best games to release in 2016. I'll admit that I was cautiously optimistic for Owlboy. As the years slipped by over the course of Owlboy's development, I went from excited by to a bit afraid of Owlboy. I thought this game could never live up to the hype generated by simply waiting. I was wrong. This game is amazing. It's one of the best of 2016, and it'll stand as one of my favorites. I can easily see myself playing it multiple times over, and I'll buy it once it hits other platforms. Hopefully that's sooner rather than later. Owlboy is fantastic. $25 is a fine price. Disclaimer: We received a code to review Owlboy from D-Pad Studio.